– Hand painted poplar wood handle painted HOT Red. – Natural wood handle painted HOT Red. – One All Purpose Cleaning Pad –with velcro on the base to secure the pad to the handle and allow easy removal for cleaning or replacement. 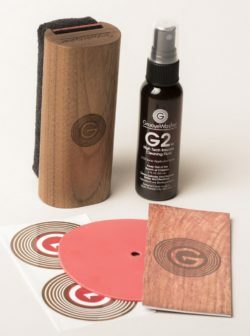 • Surfactants: State of the art surfactants, designed to dissolve the oils from fingerprints and effectively clean the vinyl record’s delicate surface. 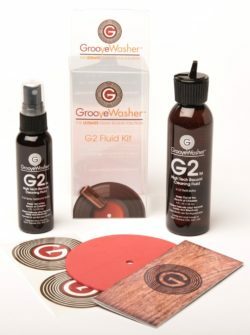 • Super wetting agents: A specialty chemical combined with a blending agent that reduces the fluid’s viscosity so it can penetrate to the bottom of the microgroove and spread the G2 Fluid across the record evenly. • Emulsifiers: Holds the oils, dirt, mildew and microdust particles in suspension until the microfiber fabric cleaning pad absorbs and pulls the contaminants from the record surface. 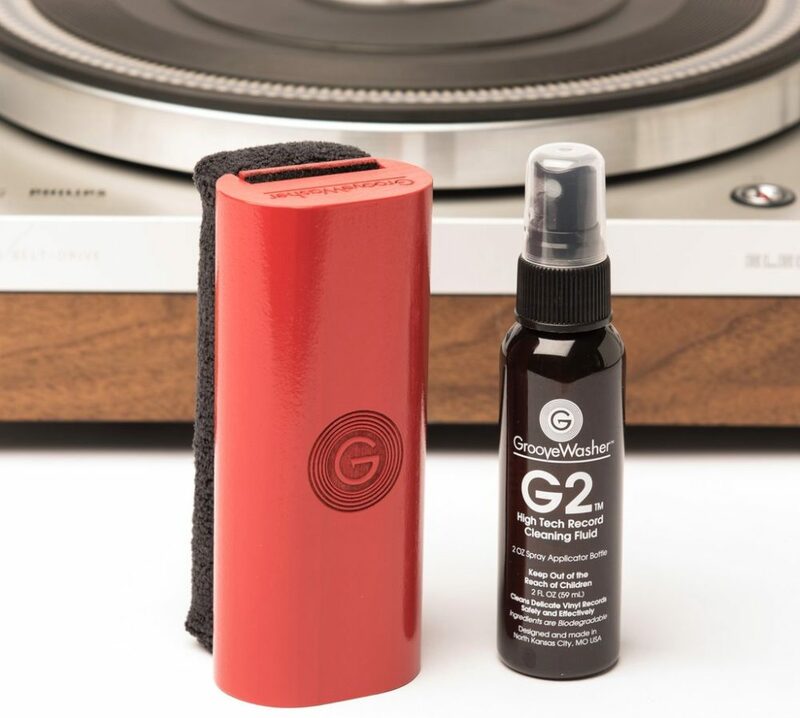 The emulsifiers restore the record’s natural shiny surface. • Purified, deionized water: Deionized water is the best carrier for the active cleaning ingredients and eliminates static electric charges on the record’s surface on contact. 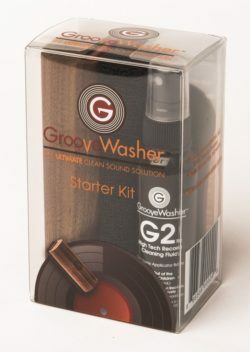 The GrooveWasher Starter Kit handle is milled from a single piece of American poplar wood, hand painted with oil enamel. We designed the handle shape to be easy to grip while cleaning your records. Hand crafted in our plant in North Kansas City, MO, USA. 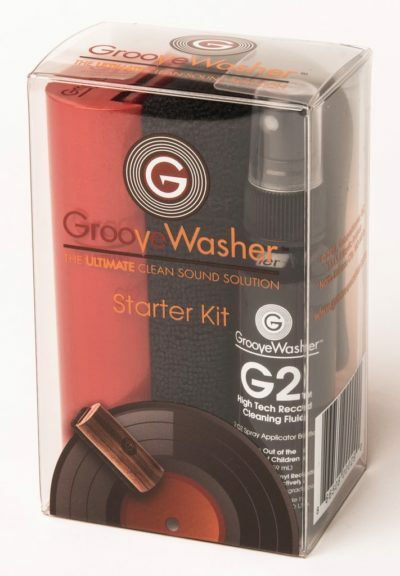 The GrooveWasher cleaning pads feature the highest quality split microfiber and other absorbent fabrics. 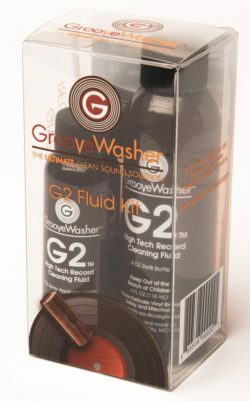 These fabrics are effective in removing the contaminants borne in the G2 Fluid from the record’s microgroove. The velcro backed pad design allows the pad to be washed or replaced. The cleaning pads are hand made in our plant in North Kansas City, MO, USA.